In hot summer, many people may prefer to stay at air-conditioning house and enjoy the cool air in it. However, if body absorbs too much cold air and is short of exercise, the physical fitness will decline obviously. It is why many people catch a cold in hot summer. Now, there is a thing that makes people take a fancy to sweat streaming in hot summer? What is it? Its name is Fosjoas K1 balancing electric unicycle. Just as its name implies, it is a tool for skateboarding, but it is totally different from traditional skateboards. 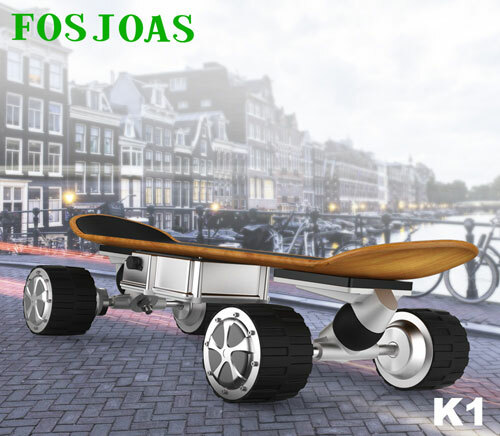 Fosjoas K1 motorized skateboard is a bright star in skateboarding world. It is powered by imported lithium-ion battery. On the one hand, battery-powered Fosjoas K1 motorized skateboard saves people physical strength and makes sliding relaxing. Usually, people won’t feel tired even if they play Fosjoas K1 motorized skateboard for several hours. On the other hand, the adopted lithium-ion battery enjoys long service life and high safety, which makes Fosjoas K1 motorized skateboard a product with high cost performance. In order to give people stable and comfortable sliding experience, two PU material damper masses are installed on the front and rear wheels respectively. In addition, the equipped 2.4G wireless variable speed remote control pushes the intellectuality to the highest point. It means that people can stand on Fosjoas K1 skateboard and use such a remote control to realize different controls. It seems as if the whole world is under the control of skateboarders. Generally speaking, Fosjoas K1 discount electric skateboards are good time killer and gives people great fun. At the same time, it is also a perfect exercise tool. In hot summer, it makes people sweat profusely but never be bored with it, which is real charm of Fosjoas K1 skateboard. You will love summer as well as Fosjoas K1 skateboard.